a waterproof mascara that doesn’t give me raccooon eyes. my lucky streak continues in finally chancing upon a long-searched-for product. I love makeup, but I don’t have the time to reapply or worry about things smudging, whether I’m busy on the floor or just out and about in my personal life. #aintnobodygottimeforthat I’ve always been envious of my girlfriends who can wear any mascara from the drugstore and have lashes for days that stay put, but I’ve never had such luck, aside from the L’Oreal Telescopic waterproof, which, of course, is now discontinued. ::side eye emoji:: prior to this discovery, I was using the YSL Faux Cils waterproof, which gave me all the volume I wanted but sometimes I still had a small amount of flaking/smudging. so far, Monsieur Big has been completely flake- and smudge-proof. I’ll let you know if that changes, but so far, it’s love. demi-fine jewelry that won’t break the bank. it’s nice to see more & more retailers offering demi-fine jewelry. it’s a great option for those of us who want some pieces of jewelry that are higher quality but still budget friendly. aside from these hoops, my husband also bought me this necklace, and I’m really pleased with the quality of both pieces. I graduated from nursing school in May 2017 and officially became licensed in September. I’ve been working as an RN for 7 months now, and I couldn’t be more proud of being part of the nursing profession. I love my job. it has its moments – crazy shifts, frustrating patients, rude family members, cranky doctors, tired feet, aching back, etc. BUT! there are so many good things, which far outweigh the bad. it’s a privilege to take care of people when they’re sick and to be able to care for them when they’re vulnerable. it’s awesome and humbling, and I am so grateful to be able to do it for a living. happy nurses’s week to all my fellow nurses! healthy snack subscription | as a nurse, every day is unpredictable and taking a break to eat sometimes gets pushed back for awhile. to fend off getting hangry/hypoglycemic, I always keep snacks on hand. I’m not above snacking on the occasional candy bar, but I try to keep my snacks somewhat healthy. having snacks delivered to my door has been a lifesaver for the rotations when grocery shopping was next to impossible. healthy & convenient = great gift. fancy stethoscope | this was the gift I requested from my parents. I had a perfectly good stethoscope that I used all through nursing school, but getting a more sensitive stethoscope is probably the most classic graduation present for someone in health care, and my parents wanted to gift me something substantial. I had my married name and future title engraved on the bell for that extra touch. apple watch | any watch with a second hand will do, so this is definitely not a necessity but would make an awesome gift nonetheless. I actually got the apple watch 2 Christmases ago from James, and I have loved using it on the floor. I love being able to quickly and discreetly scan texts and emails without taking out my phone, and I like that it keeps track of my activity level throughout the day as well. I use mine with a silicone band (tons of options on amazon, no need to buy the $50 version from Apple) to make disinfecting after a shift as easy as wiping with an alcohol swab. portable chargers | of course, what good are fancy gadgets if they don’t have any power? this portable charger is the size of a tube of lipstick – perfect for scrub pockets! – and this keychain makes charging the apple watch on-the-go a breeze. don’t forget the lighting cable! fleece jacket | hospitals/clinics tend to be cold, so I always like having an extra, no-fuss, versatile layer hanging around. I love these jackets from Columbia. no-sweat tumbler | for all his/her hot/cold beverage needs. I love that I don’t have to worry about condensation and that it keeps my coffee hot and my water cold for hours. get it in stainless steel for 25% off through June 4. you can also personalize it here (free with purchase through 6/4) or make it part of a set by tossing in a gift card and some reusable straws. phone wallet | nobody has time to look after a wallet while on the floor. I keep my license, my debit card, and my gas card in this case in my daily life, but on the floor, it comes in super handy whenever I make a quick coffee run down to the cafeteria. compression socks | because standing on your feet for 12 hours is no joke. my legs feel so much better after a shift when I wear these, but they’re expensive. gifting a pretty pair or two would be a surefire hit. lunch box* | ironically, eating healthy isn’t exactly my forte. I’ve worked on eating better by bringing my lunch most days. I love this lunchbox – it’s big enough to hold 12+ hours worth of food containers. I can easily fit 2 average sized glass containers, 3 or 4 cans of sparkling water, some snacks and pieces of fruit, with room to spare. plus, I love that they can be personalized! ID reference cards | handy for reviewing some concepts, especially when you’re new to the floor and trying to find your bearings. love that they just clip on to your ID badge for whenever you need a little bit of a refresher. 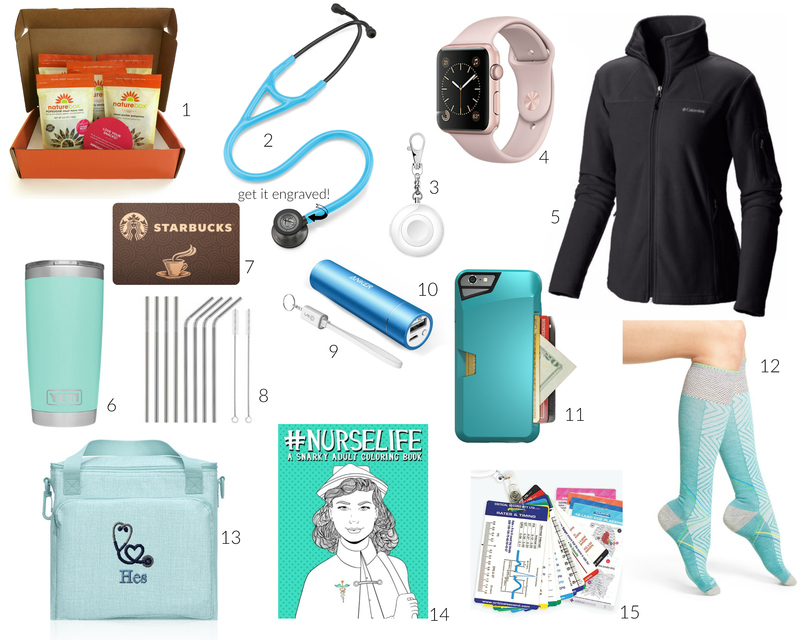 fellow nurses, any gift ideas I missed? let me know below – I’d love to see your recommendations! *full disclosure: I am an independent consultant for thirty-one, but I loved and bought their products before I became a consultant. short&lovely readers can receive free shipping and 10% off their order placed here through May 30. send me an email at shortandlovelyhes@gmail.com after you’ve placed your order, and I will apply the discount retroactively. I now have less than 6 months of nursing school left, and I figured it was long past time that I compiled a list of the things that I’ve found to be essential while on clinical. with every clinical rotation I’ve completed, I’ve taken a look at what supplies I ended up using the most and what I didn’t use at all. 6 clinical rotations in, these are what I never go without. one | you never know what the temperature will be like on the floor, but I’ve found that I prefer having a base layer underneath my scrub top. not only does it give me a little warmth, I also like having something soft against my skin instead of the stiff cotton of our student scrub top. these tops are made of jersey-like material, which makes them soft and stretchy, but they also hold their shape and fit close to the body so that I don’t add unnecessary bulk up top. they come in a dozen different colors, hold up well in the wash, and have gotten a ton of rave reviews. three | ok, ok…an apple watch is not an essential, but a watch is, specifically one with a second hand. I put the apple watch in the collage because it’s what I personally use when I’m on the floor. I pick a face that has a second hand and make sure that I use a sport band that’s made of easy-to-clean silicone. it’s also a nice way to keep connected to the outside world on break or when I get a moment (in the bathroom…ha!) without having to take out my phone. four | compression socks are amazing. that is all. I’ve tried several kinds but I’ve found these have a good amount of compression, stay up, & are pretty (equally important). I never thought I’d buy $25 socks, but they’re worth it in my book. five | I’ve quickly learned that it’s never a bad idea to have a snack in your scrub pocket in the event that you have a crazy busy day and don’t make it to lunch until 2 p.m. (if ever). I tend to get hypoglycemic, so I always make sure to have one of these bars on hand. they’re delicious & fit perfectly in my scrub pocket. six | a pen light is super important when doing physical & mental assessments. I found this one in the hardware/automotive section of target of all places, but I like it way better than any “medical” version I’ve found. it has a clip, shines brightly, and it has a click mechanism that isn’t easily engaged, saving your batteries for when you’re actually going to use it. seven | most patient rooms I’ve worked in have these dry erase boards that are used to communicate some basic important information – the patient’s name, goals for the day, nurse, nurse assistant, schedule for pain meds, etc. the markers that come with the boards are prone to go missing, so I’ve found it best to have my own so I can update as necessary without having to hunt a marker down. nine | I’ve come to be really well-versed in a lot of the medications I see given to patients, but of course, every once in a while, there’s a drug that I’m not familiar with. this pocket drug book is perfect for those situations when I don’t have time to log in and look up the drug information on the computer. ten | I carry two pens with me when I’m on shift – one with black ink (for official documentation) and one with colorful ink, like purple (for making easy-to-spot notes on my copy of the patient’s chart at report). click pens are best because no one has the time to recap or look for caps, plus the little clip lets me anchor it to my top or pants easily. I’m partial to these from muji. I also like to keep a cheap pen on hand (usually given by the hospital/clinic) in case I lose my pen or, more likely, for when a doctor or friend asks to borrow a pen. this way, I don’t feel bad if that pen never gets returned. eleven | I must wash/disinfect my hands at least 50 times per shift, and it shows. my hands get very dry from all that scrubbing & alcohol, so I make sure to regularly use some hand cream. this one from l’occitane in the original shea butter is my go-to. it’s rich without feeling greasy, it absorbs and gets in really deep, and I find the scent to be soothing and subtle. I keep a travel-sized tube permanently in my nursing bag. twelve | nursing involves a lot of paperwork. this folding clipboard has been great at keeping all of them together. I love that it folds so that I can put papers away in my pocket but then can take it out and unfold it to a regular clipboard for when I have to do some documentation. it is expensive for what it is, but the folding feature is so convenient. thirteen | this one’s obvious: a stethoscope. I have 2, one from Littmann and one from MDF (pictured above). there’s some debate as to which stethoscope brand is the best. I think if you invest in a good quality stethoscope (any brand), I think the better stethoscope is the one being used by the clinician with the better ears. clinically, I’ve been happy with both of my stethoscopes, and I think they’ve both been more than sufficient for nursing school. I’ve been using the MDF one more often lately because it’s slightly longer than the Littmann one, making it easier for me to reach farther parts of the body without bending quite as much. I also like the all black aesthetic of it (my Littmann one has green-blue tubing). for graduation, I am asking my parents for an engraved Littmann cardiology IV stethoscope that I’ll use in my professional career. fellow (student) nurses, what are your go-tos? any big ones I missed? let me know in the comments! it certainly doesn’t feel like fall at all, but my academic year starts a week from today so I had to get started on a portion of my capsule wardrobe earlier than seasonally-appropriate. for this rotation, I’ll be required to wear business casual clothing at my clinical sessions. for my program, ‘business casual’ means no jeans, closed-toe shoes (with hosiery), and a semi-dressy top with a conservative neckline. keeping these requirements in mind, I took a good look at what I had in my closet and then pinpointed some pieces I needed to buy: some dressy shells, top layer options, more professional-looking flats, and a good pair of black trousers. some of the pieces above may look familiar because I highlighted them as things I was eyeing during the nordstrom anniversary sale. obviously, some things worked out! one | the only item I purchased that wasn’t on sale were these pants. they were more expensive than I wanted, but they fit perfectly, are machine-washable, have good stretch but still structured, and highly recommended by my boss and several friends. I had planned on buying two pairs of trousers but ended up just buying just this pair because of the price and because no other pair came close in comparison. two | I finally found a blazer that works for my body, so I bought it in three colors! they wouldn’t work for a completely business-attire environment, but for business casual, these are perfect. the knit is comfortable, and the open front is really flattering on me. three | these flats are fierce, and I’m so glad that I guessed the right size before they sold out. this pair was a 2-for-1: I was looking to replace my pair of smoking slippers and for a pair of dressy flats. four | these tanks are long enough on the bottom and high enough on the neckline to be appropriate, and I plan on wearing them underneath a cardigan or a blazer. they are a bit sheer open in the lower back, but I’ll have a layer on top to cover that detail during clinical. plus, that lets them be a great going-out option, too. five | I was so pleased to find a long-sleeved blouse in a mixed-media design – the knit back is great for comfort & ease of movement. the neckline doesn’t come down too low (no hint of cleavage), and the tunic length & long sleeves make it a great piece that doesn’t require a top layer. six | as for this cardigan, I wasn’t sure about the ruffles (I tend to like pieces that are a little more streamlined), but I was surprised to find that it looked really good on and added just the right amount of unexpected detail. the sweater part is the perfect light grey and is ridiculously soft. 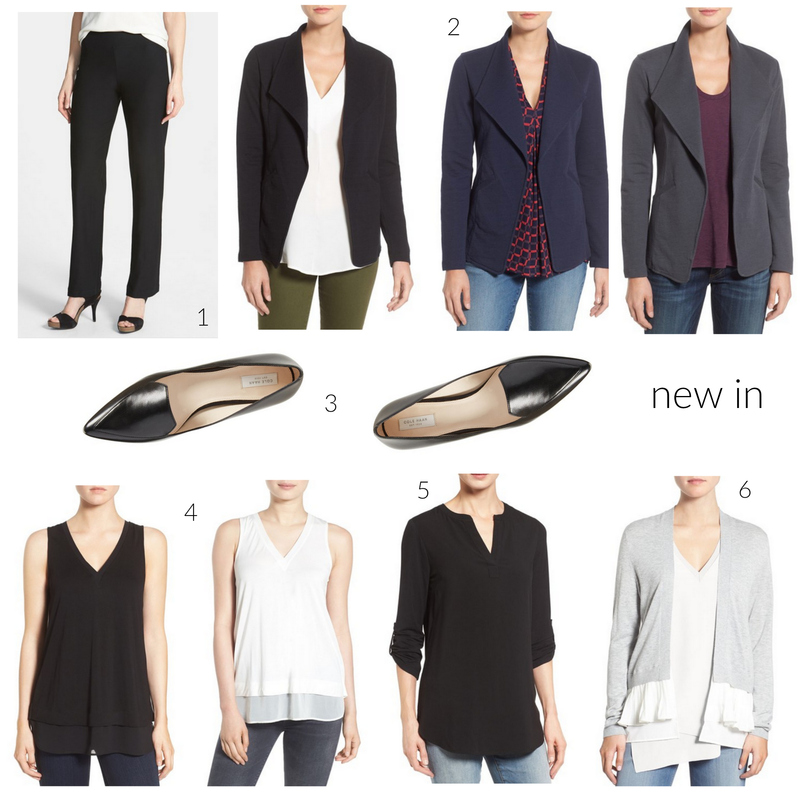 these are the pieces that I already had, rounding out my 16-piece clinical capsule wardrobe. seven | I couldn’t find this exact turtleneck online in the black but it comes in a bunch of other colors, and this is a thicker option. I like the tissue weight because it lies flat and makes it really easy to wear under other pieces of clothing. eight | this cashmere sweater is actually from the men’s section. I prefer the way their version drapes on me as opposed to the women’s version. 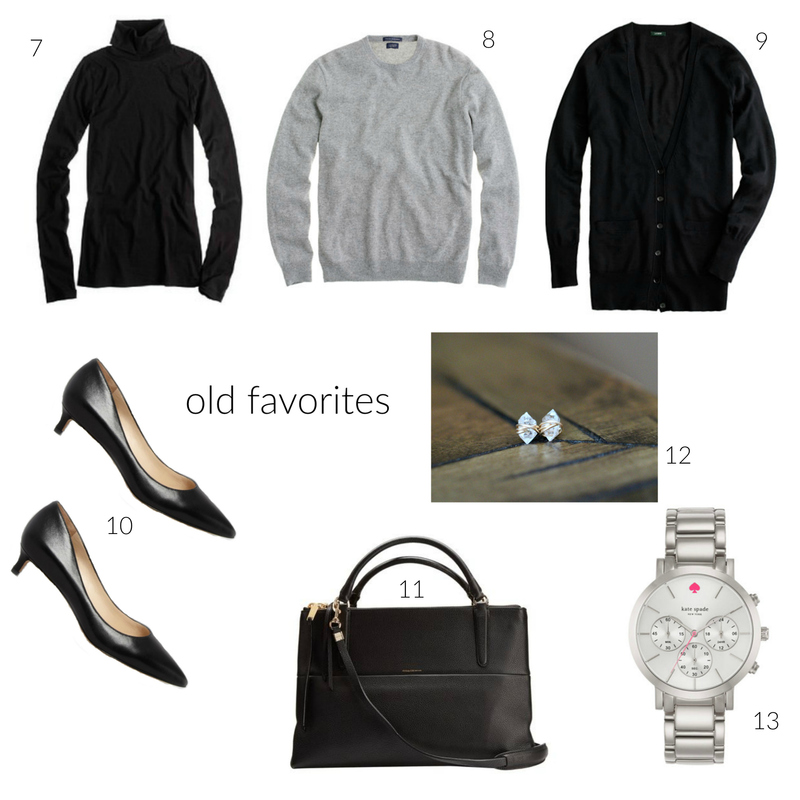 nine | this cardigan is a great basic and is a workhorse staple in my wardrobe in general. the wool is warm but thin enough to not be too bulky. ten | this is an old pair from via spiga that I scored at a great price at nordstrom rack a couple of years ago, but this is a similar pair in classic leather with a work-friendly kitten heel. eleven | this coach bag was a christmas present a couple of years back. it’s such a great classic shape in a not-too-big but not-too-small size. sadly, coach no longer makes this exact style, but this, this, and this are similar. twelve | aside from a watch and my wedding band, the only jewelry I’m allowed to wear is a pair of stud earrings. these are one of my favorites. I love that the raw cut of the herkimer diamond gives a little edgy twist to an otherwise classic earring. thirteen | every nurse needs a watch with a second hand. I prefer to wear a watch with a metal or silicone band because it’s easier to disinfect and I don’t need to worry about getting it wet every time I wash my hands. this watch has a really versatile shape, and the pink second hand is a nice touch.